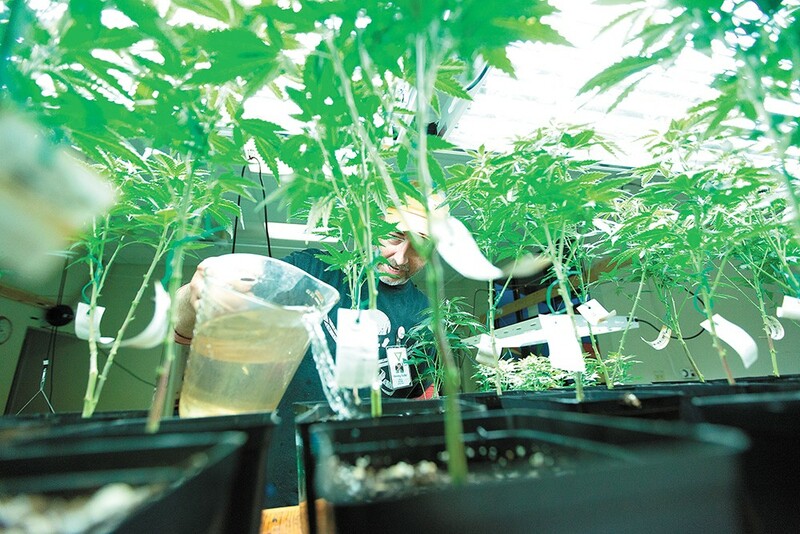 Wesley Tuttle waters a pot plant at Yield Farms. Not often when we spark up do we wonder how exactly our bud was grown. With the ever-evolving industry of post-prohibition pot, commercial farming allows for a multitude of ways for cannabis plants to be grown. There are three standard bases for farmers: soil, cocoa and hydroponic systems. If a grower is concerned about maintaining an organic operation, they will likely stick to soil — as will beginners and many high-volume farms due to its forgiving nature. "It already has microbes that help the growing process and you don't have to worry about the pH levels of the plant as much," Lilac City Gardens grower CJ Palmer said. "Soil has the capability to buffer the roots when dealing with acidity or certain environments, so you don't have to be as worried about things like the temperature of the root zone." You can also add nutrients to the soil if needed throughout the process. But if you're doing a living soil or compost, the soil is already equipped with precious minerals and microbes for the soil's entire life cycle. Cocoa is a base for beginner and intermediate growers. Its light or airy density allows for more air to the roots. You have more control of what happens in terms of the plant's intake throughout its growth. Unlike soil, you have to pay more attention and actively maintain the pH level. "A too-high pH level will burn the plant and stunt the growth, ruining the disbursement of nutrients," Palmer said. Hydroponics provide more control of the growth, but are for more experienced growers due to the vulnerability of the plant itself. It's incredibly porous so there is a greater amount of air flow. "It's incredibly easy to screw up because of the lack of buffer for the roots of the plant," Palmer said. "Your measurements of pH and parts per million (ppm) need to be precise." Palmer prefers hydroponics, using a base called rockwool, which kind of looks like the material used for insulation. "It is great at retaining water while still helping the roots receive more oxygen," Palmer said. The original print version of this article was headlined "Green Thumbs"